If you like stable and long flights - this one is for you. Camera is not that great. The JJRC H11wh is an upgraded version of the previous model. 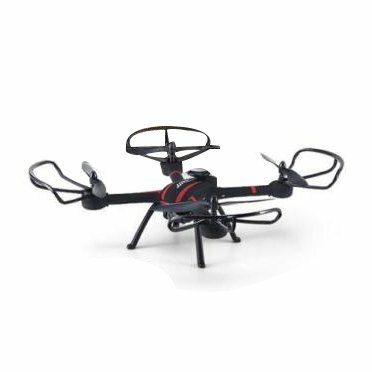 This drone has a very low price and it is one of the top selling drones available on the market. It has a few interesting features that make it worth the money and it looks just perfect for beginner pilots. The H11WH comes almost ready to fly out of the box and it is equipped with many features not often seen in a low priced drone, such as Wi-Fi FPV and Altitude Hold, 6-axis gyro and HD camera. 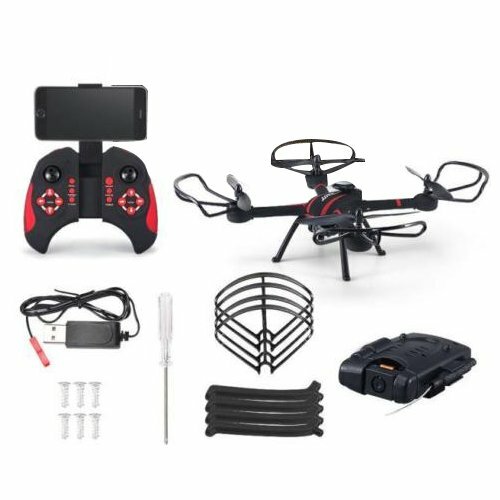 The drone is perfect for those pilots who want to develop their FPV flying skills and perfect for newbies who want to develop their flying skills both outdoors and indoors on a calm day. The H11WH is considered to be one of the very best low priced drones currently available on the market. The JJRC H11WH is a small compact drone that has a small FPV camera attached to it. The drone has a cool appearance and smooth design. The build quality on this drone is very good and it is covered in rubbery plastic. This feature makes the drone more sturdy and gives it a very premium look. The drone has a wingspan of 270 mm and it is below average in size. The H11WH weighs in at 132 grams and it is slightly below average in weight. This drone has brushed motors and it is well-known fact that they last only around 10-30 flights and needs to be replaced. This is one of the biggest problems with these motors. However, the manufacturer found a way in order to allow simple and without soldering replacement. You have easy access to the motors through specially made compartments so you can change the motors if necessary. The drone is equipped with colorful LED lights that make flying and controlling the machine easy even in the middle of the night. There are five green LED lights on each side, 2 blue ones in the back and a large angry red “eye’ in front. As far as color goes, the drone comes in a rubberized black finish with red markings. battery. This means that the drone uses an above-average sized battery to power its flight. However, the lower voltage (3.7V) makes it a bit less powerful than other drones. But even so, the drone flies pretty well in speed mode. The battery takes about 150 minutes to charge completely and supports about 7 minutes flying time. However, when estimating flight time it is also important to account for the takeoff weight. It is also very important to let the motors cool down between flights. It is important to note that you can turn off the lights to get even more flying time out of this drone during the day. You do it by pressing the top left button for 2 seconds. Also, the USB charging cable has around 65.5cm and is suitable for you to charge the battery via laptop or computer. The JJRC H11WH features the 2MP camera can provide more clear 720P FPV and you will be more than impressed with this camera. The camera allows you to capture and record every beautiful and unforgettable moment. Also, the tilt angle of the camera’s lens can be adjusted in order to obtain the best field of view. The stability of the drone made for a very well stabilized video but the FPV function has some slight lag, which doesn’t make for a good racing drone. When trying to adjust the camera to get the perfect footage, the live feed transmission is very helpful. The camera is more of a “fun” camera than a high quality one. This means that the H11WH is perfect for those who just want to fly for fun while capturing some photos or videos. Also, the 720p resolution on the drone means that it can record in at the lowest quality HD available and this drone is probably in your price range if video quality is not one of your top priorities. It is important to note that the camera and recording functions are not controlled by the transmitter but by the App of phone. The controller is a real pleasure to hold in the hands and it is made from the same high quality material as the drone. It is very smooth to touch and you will definitely like the design of it even more that the drone itself. However, the controller doesn’t have an LCD screen like most others do. It requires 3 AAA batteries to work. The controller is equipped with a phone holder. This allows you to install your Smartphone on the top of the drone in order to display the camera’s live video feed. The controller comes with trimming buttons for all directions. This feature allows you to trim the drone back to stability in case your aircraft tends to fly off in a certain way. The controller also has 2 buttons that change the camera angle up and down, which can be very useful for when you want to catch a different angle or want to take a glimpse of yourself. slot and dedicated START/STOP button to power the motors. There are also specific buttons for photo and video capture. However, they don’t work on this Wi-Fi version so you’ll have to use your phone to trigger video recording on the drone. Also, the control scheme is very well thought out. It has clear instructions on what each button does right on the transmitter itself, which is very helpful for beginners. The H11WH also features Wi-Fi FPV system that allows real time image transmission when you connect your drone and phone via Wi-Fi. Another amazing feature is an emergency stop button that is enabled by pressing in the right stick. It is important to note that you will never experience any transmission issues with 2.4 GHz 4 channel transmission. is super stable due to the inbuilt altitude hold. The drone also features 6 axis gyro that provides best stability during indoor and outdoor flight. The gyros can be easily calibrated by the press of a button. The drone has three levels of control beginner, intermediate and advanced. The drone is also equipped with 360-degree rollover function. Just press the button on the controller and you will get 360-degrees flip that will make your drone turning around and around like an excited bird. There’s also a Headless mode feature that works really great. It can get you out of trouble if you lost the direction your drone is facing. The drone also features the integrated barometric air pressure sensor. This allows the drone to maintain its flight altitude stable at the desired level. There is also air press height hold that improves the stability of flight and video recording performance aerial photography. The JJRC H11WH also features one press automatic return that ensures you can call back your drone without any delay. There is also one key reset, so if the drone deviates the original way because of the complex operation, you can only press one key to reset it. The JJRC H11WH is extremely affordable and incredibly easy to fly drone. The build quality is very good and the camera is very entertaining. The drone is also packed with many amazing features found on more expensive drones. The H11WH is perfect for those who want to experience a more stable and longer flight.